The Harold Pinter Theatre, formerly the Comedy Theatre until 2011, is a West End theatre, and opened on Panton Street in the City of Westminster, on 15 October 1881, as the Royal Comedy Theatre. It was designed by Thomas Verity and built in just six months in painted stone and brick. By 1884 it was known as just the Comedy Theatre. In the mid-1950s the theatre went under major reconstruction and re-opened in December 1955, the auditorium remains essentially that of 1881, with three tiers of horseshoe-shaped balconies. In 1883, the successful operetta Falka had its London premi?re at the theatre, and in 1885, Erminie did the same. The theatre's reputation grew through World War I when Charles Blake Cochran and Andr? Charlot presented their famous revue shows. Famous actors who appeared here include Henry Daniell who played John Carlton in Secrets in September 1929. The theatre was notable for the role it played in overturning stage censorship by establishing the New Watergate Club in 1956, under producer Anthony Field. The outdated Theatres Act 1843 still required scripts to be submitted for approval by the Lord Chamberlain's Office. Formation of the club allowed plays that had been banned due to language or subject matter to be performed under "club" conditions. Plays produced in this way included the UK premi?res of Arthur Miller's A View from the Bridge, Robert Anderson's Tea and Sympathy and Tennessee Williams' Cat On A Hot Tin Roof. The law was not revoked until 1968, but in the late 1950s there was a loosening of conditions in theatre censorship, the club was dissolved and Peter Shaffer's Five Finger Exercise premi?red to a public audience. The theatre is a part of the Ambassador Theatre Group. The theatre was Grade II listed by English Heritage in June 1972. 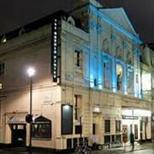 On 7 September 2011 it was announced that the theatre's owner, Ambassador Theatre Group (ATG) would be renaming The Comedy Theatre to The Harold Pinter Theatre from Thursday 13 October 2011. The Harold Pinter Theatre is just a couple of minutes walk away from Piccadilly Circus tube station, served by the Piccadilly and Bakerloo lines. Leicester Square tube station is also nearby, about a five minutes walk away. The venue is in central London so it is advised that you use public transport where possible. Bus numbers 6,12,13,15,22B,38,53, 88 and 159. There is parking at the NCP car park at Whitcomb Street. The Box Office and foyer are situated at street level. The Stalls seating is accessible down a flight of 23 steps. The Dress Circle seating has the easier access, being on foyer level and can provide up to 4 wheelchair spaces per performance. Seats in front of these spaces can be moved forward to accommodate longer chairs and small scooters - Please contact the access line to book and for more information on 0844 871 7677. They have a dual channel infra-red sound enhancement system in the auditorium. Using a headset (without a hearing aid) or one that is worn around the neck (with a hearing aid) you can boost the volume of the performance. To book access tickets and for more information, please call 0844 871 7677.